Coyotes are mid-size animals, standing approximately 18 inches at the shoulder and resemble a small german shepherd, but with a longer snout, and a varied grey-to-sand colored pelt. They can be seen in the day but are generally night time predators. Although they can live a solitary life or with a mate, they can also be found in packs. It is possible to site coyotes anywhere in the southwest, certainly in rural areas, but more frequently sightings occur in suburban areas. In general Coyotes shy away from humans and avoid contact whenever possible. They can only typically be seen at a distance and will not approach humans. What is concerning though is when coyotes live in suburban communities, for long periods of time, perhaps over multiple generations, their fear of humans decrease and their acts of aggression increase. If you observe any of the following warning signs, it is highly recommend you take some form of action, whether it be preventative measures, or contacting a licensed wildlife removal company like Wildlife Removal Services. Increased sighting of coyotes on streets and in yards at night. Sighting coyotes in daylight hours. Coyotes stalking or harassing people and/or pets. Coyotes sighted near parks and recreational facilities where children frequent. 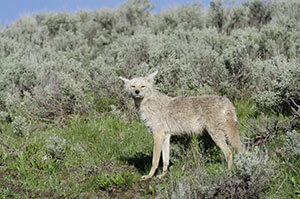 Coyotes pose the greatest risk to livestock and pets. Since they often travel in packs of up to 10 strong, and are able to find their way into most yards, pets and livestock left outdoors at night, especially those near canyons, are at risk of attack. While Coyote removal does help, often the void created from the removal of coyotes is often filled by coyotes from other territories moving in. Be aware, Coyotes can easily jump 5-foot fencing and can scale fences as high as 6-feet. So if you have coyote sightings in your fenced yard, or wish to make it so they can not get in your yard, Wildlife Removal Services is a licensed installer of the Coyote Roller, a humane and effective way to prevent coyotes from leaping your fence. Coyotes will range wherever they can easily find food and shelter. Removing sources of water and removing or thinning of surrounding brush around the house can help reduce the risk of encroaching packs. It takes away places for Coyotes and their prey to hide. Coyotes will eat fruits so be sure to pick all ripe fruit from any tress, and avoid letting the fruit fall and remain on the ground. Be sure to clean and maintain bird feeders. Any spilled seeds could attract rodents and rabbits and thus attract coyotes as well. Pets should be fed indoors but if you do feed your pets outdoors, make sure to empty the dishes of any stray food. If you or your pet are approached by a coyote, try to intimidate and frighten the coyote by shouting loudly, waiving your arms, and even throwing objects. If you are sitting, then stand up. If you have a jacket or coat on, spread the clothing out to make you appear as large as possible. If you need to retreat, do so by backing up slowly while keeping eye contact with the coyote. If you or your pet does come in contact or is bitten by a coyote, immediately wash the area or bite with warm soapy water. 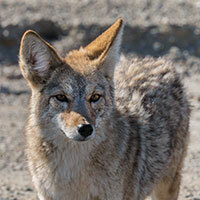 While most problem coyotes are healthy, there is always the risk of infection or exposure to rabies. Get medical attention immediately.